I’m thinking next year I may stack on one more layer of landscape timbers to my border and add more dirt. Just to get the the garden up a little higher. I don’t really have drainage problem. I’d just like it to improve it. 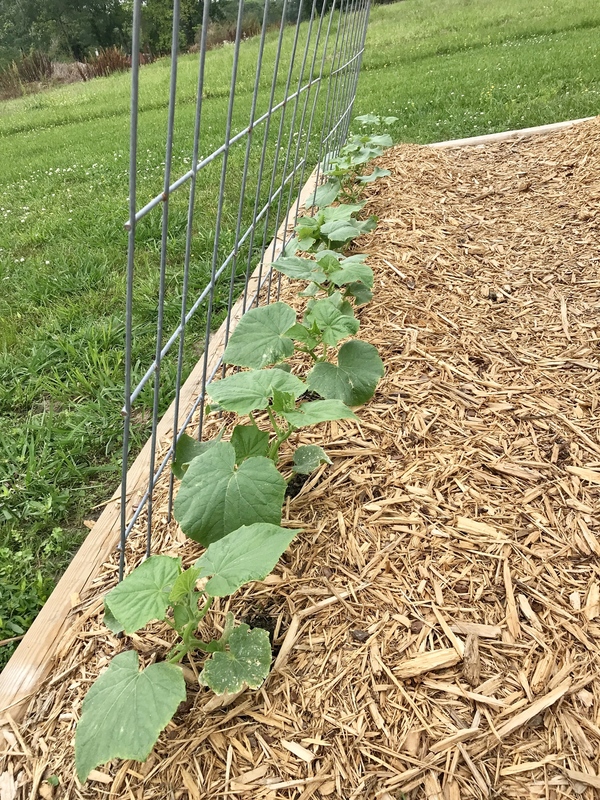 It was a race against time for most of the weekend due to rain, but got my second 4x8 raised bed built, filled, and planted along with the rest of the other beds. 4x4 bed has: Thyme (year round grower so permanent spot), cherry bell radishes (first crop about ready, next crop is sprouting), sweet basil, lemon basil, dill, cilantro, snow peas, pickling cukes, french bush beans. 4x8 Bed 1: Deer tongue lettuce (isn't doing crap), oak leaf lettuce (doing well), arugula (going crazy like last year), bibb lettuce, and nasturtium along the front. Back has Thai bird chili, habanero, jalapeno, and Anaheims. Still have room for one more pepper so probably will be pablano or serranos. 4x8 Bed 2: (2) Zuchinni and (2) Yellow Squash, Clemson musk mellon, tomatillo, indigo cherry drop cherries, cherokee purple, and San Marzano maters. Pots: Spearmint (growing from last year), strawberries, chives, and Mexican sour gherkins. First time growing the gherkins so should be interesting. Also planted a triple crown thornless blackberry next to the salmonberry bush to go along with my pomegranates, persimmon tree, blueberries, and pineapple guavas. How tall are your 4x8s? Ideally you want to remove the grass, till the subsoil, build up the bed with new soil, and then plant. 12 inches. I used 5/4x6x8 pressure treated decking boards. 4x4s in the corners to screw the boards on to. I've got some extra of the 4x4 to make a few more posts if the x8s start bowing. The 4x8 I built last year hasn't needed them so far though. Thanks for the info. Can you post a picture of your string trellis setup? I’m moving to Madison, AL and have to start all over. Looking for ideas to hit it hard right when I get there at the end of April. I don't have it up yet because I just planted the tomatoes and I haven't set it up in the new bed yet, but I can describe it. I bought three six foot metal T-posts uses for fencing. One on each end (length wise) of the 4x8 bed, with the third in the middle. It will be inside the bed even with the other two. You want all three posts basically to hit the middle of where your tomatoes are going to be. Then I have two plants between post 1 and 2, and two between posts 2 and 3. Start with string on one side, go to one side of the the first tomato plant, then the opposite for the next. Then you can either tie off to post 2, or keep weaving to the front and back of post two, through the next two plants, to the last post. Now go back and do the same, but on the opposite side. What you want to end up with is string on both sides of each tomato plant. Hope that helps, and maybe someone has some actual pictures to give you a better idea. Don't have anything right now. Starts are too small to bother with the string. I'll try and at least get a pic of the basic setup (posts and location in the bed) tonight when I get home (if I remember). We did end up with a light frost last night in the low areas. Will be planting everything on Friday. I've got 5 2x4 grow boxes on legs and a crap load of 5 gallon buckets. I'm running running cable over the buckets at about 8' up and running lines down to the buckets for the beans and tomatoes. I'll hang netting for the cucumbers from the cable as well. We shall see how this goes. I was originally going to do a Dutch Bucket hydroponic setup, but will tackle that one next year after I build a green house. Pics of your setup if you have a moment this evening would be awesome. Everything is growing fairly well except my cucumbers. They just don’t seem to want to take off. They’re growing, but really slow for some reason. Pillage same here. Started from seed directly sown and they are like 3 inches off the ground with just a couple leaves. They are taking forever. For those who wanted pics I haven't forgotten. I'll get around to it eventually. Thought I lost my San Marzano, but the plucky little guy seems to be bouncing back. Pulled my first cherry bell radishes yesterday and cut them up in a salad for dinner. Damn those things are good! I should have squash and zucchini ready to pick in a couple days. Pepper plants have tons of peppers. Tomato plants have a good bit of small tomatoes and lots of blossoms. Cucumbers are taking their sweet arse time. I wonder why everyone’s cucumbers are so slow this year? It’s been plenty warm enough the last few weeks. By this time last year my cucs were about 4 feet up the trellis. At least your cucs have sprouted and are growing. My snow peas are growing slow as hell too. At least they're climbing the trellis now though. That’s as far as they’ve got so far.